Looking for an exciting science fiction novel to enhance your child's love of reading? 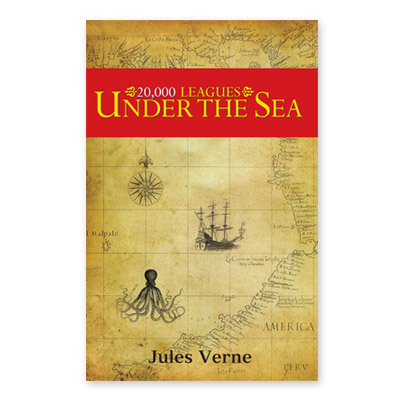 Then explore the underwater world of Captain Nemo and the Nautilus in the pages of Jules Vernes' classic, 20,000 Leagues Under the Sea. This 322-page paperback book for grades 7 and up is sure to captivate your child as he experiences adventures to worlds unknown! Awaken your child's imagination and revive his love of reading with the gripping science fiction novel, 20,000 Leagues Under the Sea. Set in the 1800's, this compelling classic follows the narration of Professor Pierre Aronnax and his expedition in search of a dangerous sea monster sited by several nations. After leaving New York and traveling around the tip of South America to the Pacific Ocean, the supposed monster is found and a battle begins to capture it. However, during the fight, the ship is damaged and the Professor and his party are thrown into the sea. Landing on the creature, they discover it is made out of metal and actually the submarine Nautilus, created and commanded by the mysterious Captain Nemo. Quickly captured and brought on board, the professor and his fellow scientists are forced to roam the seas in the secretly-built sub and to remain on board so as not to betray its existence to the world. Will Professor Aronnax and his associates ever be able to escape? To find out the answer, your child will have to read to the very last chapter of this thrilling novel. Don't wait any longer to add 20,000 Leagues Under the Sea from Alpha Omega Publications to your homeschool library. Order your copy today!